The most important thing I have to say about BioShock is this: I'm going to play it again. Not "someday" or "when I don't have anything else to play." Tonight. As soon as I get home from work, and less than 48 hours after I finished it the first time. Granted, one of my motives for doing so is to get a second chance at scoring some of the achievements I missed the first time through, but it was also such a powerful experience, I want to go through it again. Playing BioShock is like eating a whole bag of Doritos or drinking before noon; sometimes you just have to do it because you're an adult and it feels good, and you can. We don't give scores here at The Escapist, so it's not possible for me to either endorse or dispute the seemingly unanimous perception of BioShock as being a rare 10-out-of-10 game. Not in numbers, anyway. I don't agree with that assessment, for the record. I think the game is brilliant, well-designed, moody, dark, intense, multi-faceted, engaging, mysterious, shocking, disturbing, fascinating, smart, funny and fun. But it's not the perfect game. Not for anyone. Not really. In my first impression piece I said the game, four hours in, still smelled like a new Buick and still felt like it had the potential to be one of the greatest games ever. I don't regret saying that, because four hours in, it's true. That's still true eight hours in, 12 hours in and even 20 hours in. Even now, after I've finished the game, I still believe it could be one of the greatest games ever made, but that new Buick smell has faded, and the cracks in the leather upholstery are starting to show. But first let's talk about why the game is worthy of the adjectives with which I've cloaked it. 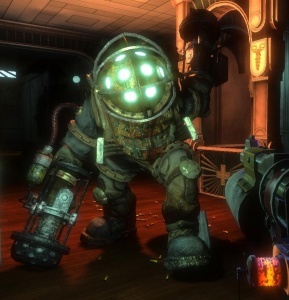 First off, the beginning of BioShock is the best 20 minutes of any videogame ever. It easily displaces the beginning of Half-Life as the most innovative and engaging way to introduce a game world. Yet unlike in Half-Life, in BioShock you're not a helpless audience member being shown intriguing bits and pieces of scenery as they roll beneath your tram car. You're an active participant, discovering mere flashes of insight into the world you've discovered and are slowly convinced to take part in events that will move mountains. Is there choice in this game? No. Not really. You're offered the opportunity to exercise your existential angst over whether or not to damage the Little Sisters in order to harvest their Adam, the life-giving substance responsible for genetic mutation and long life, but from the beginning forward you're essentially on a path to do whatever the designers of the game - and the puppet masters of Rapture - want you to do. It's an object lesson in the terrifying nature of fate and is all the more engaging for its lack of pretension. A carnival house of horrors in which you hold the gun, but feel nevertheless completely at the mercy of the man behind the curtain.